This is another one where it would be way too easy to eat the whole package in one sitting. A very little bit of a smokey peppery earthy taste mixed in with creamy, but not soft, English cheddar is the best description I could come up with. That description doesn’t do it taste justice. It may not be to everyone’s liking, but this is very good. Of particular note are a couple of the lesser ingredients, anchovy and bamboo fiber. What’s This For? Well I sure don’t know, but whatever the reason the whole seems to work just fine. At $9.99 per pound, this is in line with similar cheeses at Trader Joe’s. The calories, at 110 per ounce (28g), are also similar to other cheeses. 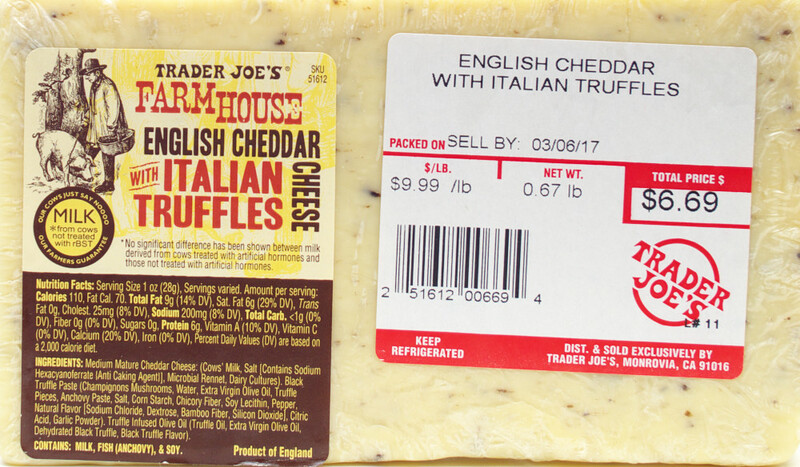 This entry was posted on 03/16/2017 at 19:59 and is filed under Recipes, food, cooking and related items, Trader Joe's. You can follow any responses to this entry through the RSS 2.0 feed. You can leave a response, or trackback from your own site. Thanks for the update. I’ll miss it also. Try asking at your local trader Joe’s. They’re usually very helpful. Hi, is the milk used for this cheese pasteurized? It doesn’t say on the package. Not overpowering in my opinion, but there was enough of it to know this was more than a cheese. I thought the balance worked very well. This is not for people who like only the mildest cheese. But for people who are a at least a little adventurous, this is a very interesting combination. Thanks for the like. Unfortunately I read the label after I ate the cheese. Next time I’ll know better. Maybe?